If you like Kyoto, but don’t know much about Gion, the Geisha district in Kyoto, or you would love to know more like where is Hanami-koji street and Gion Shirakawa, or how can I meet Geisha? Then this article will help you decide where to go, what to do, and where and when you could see a Geisha – even how you could enjoy their company. Even for both Japanese men and women, it is a dream to meet a real Geisha in Kyoto. Geisha are not just decorative figures to look at, they are in fact experts of entertainment, and are actually professional hostesses. Now you are thinking, “Should I go to Gion in Kyoto in order to meet a real Geisha”? I can also imagine that you feel you need to know more about Gion before you make a final decision? Would you love to know where the best place is in Gion to meet a Geisha by chance? Are there any other fun places in the Gion area, and where else in Gion should you consider going? Let me talk a bit about “Gion, Geisha District of Kyoto”, and answer some questions so that you don’t miss any opportunities to meet a Geisha – which might be that once in a lifetime opportunity. 3 Why don’t you feel Zen at Kennin-Ji Temple in gion district? Gion by day is an attractive area in which you can stroll and enjoy sightseeing; temples, shrines, cafes and souvenir shops and also some very Japanese activities, such as Zazen, a meditative discipline are all easily accessible. Gion is located on Shijo Avenue which is close to Yasaka Shrine in the east, and to Kamogawa river in the west. The nearest stations are Gion Shijo (祇園四条) station on Keihan (京阪) line and Kawaramachi (河原町) station on Hankyu (阪急) line. Hanami-koji Street (花見小路) is the most famous, and interesting, street for both Japanese and non-Japanese visitors. It runs for about 1km from Sanjyo-Dori street in the north to Kennin-Ji temple in the south. This is Gion’s main street, and it runs through the middle of the entertainment district. It traverses very Kyoto-esque places, such as temples, shrines, and ochaya, but also a selection of bars and Izakaya (a Japanese style of British pub). There are no tall modern buildings, just traditional machiya (Japanese style wooden houses) which are all almost the same height, and run down either side of the street. Whilst walking along Hanami-koji Street, there is plenty to see. You can discover various shops along the route and soak up the atmosphere that is always apparent. But it will be busy – attracting many people, who like you, are happy to walk and discover old Japan all day long. After all, Hanami-koji Street resembles a Japanese movie set, and you could easily imagine a scene from a Samurai movie as Toshiro Mifune, in a blaze of flashing steel, exchanges cuts and blows with his foes! Why don’t you feel Zen at Kennin-Ji Temple in gion district? Let me tell you about Kennin-Ji Temple. It is a striking temple, the first Zen temple in Kyoto, built by Eisai, a Buddhist priest in 1202. The temple owns many treasures, and one of the most famous ones is the national treasure “Fujin Raijinzu Byobu” (風神雷神図屏風). It is a folding screen, though the one currently on display at the temple is an elaborate replica, but you can still see the beauty of the screen, and its use of shining gold.You must also make sure you see the many Fusuma-e (drawings on the sliding doors) and the stunning dragon drawing “Soryu-zu” on the ceiling of a Hatto (法堂) where priests give lectures, and the life-like dragons leap from the drawings! Kennin-Ji Temple gives visitors the opportunity to experience Zen, and also offer a Shakyo, Sutra copying experience. Shakyo, just costs for 1,000 yen and no advance booking is required. Just go to the Honbo and let them know. All the necessary things you will be prepared for you. Gion Corner is a great theatre where you can watch all Japanese traditional arts, such as Kyo-mai dancing, flower arranging, Tea ceremony, Koto music, Gagaku music, Kyogen and also Bunraku (puppet theatres). All are set as a whole package. Each performance is on from 6:00 pm and 7:00 pm every day, and individuals don’t need to book in advance. Please be aware that performances are on Friday, Saturday, and Sunday only from December to March. A fantastic day of theatre and traditional Japanese performing arts, all combined with Kyoto sightseeing, followed by a sumptuous Japanese meal. There’s nowhere else to experience these arts in one place – quite a full Japanese day! ※ Friday, Saturday, Sunday and national holidays only from December to the second week of March. Duration time is for 50 minutes. This is the discount for foreign visitors only. Gion Corner would like to encourage those to discover Kyoto’s traditional culture. It is a good deal for you! No booking is required in advance, please just go to a reception on your arrival. Gion Shirakawa is a beautiful place where you can really get a sense of Kyoto. Any season, any weather, the continuous view of Machiya, merchant family houses, and cobbled paths make up the Gion Shirakawa. A place to visit and enjoy, and immerse yourself in the atmosphere that is uniquely Kyoto’s – you might also be able to meet Geisha too! There is no better place than Gion Shirakawa during the cherry blossom season. Beautiful blooms in the Spring sunshine, and at night, an awe-inspiring stroll amongst the illuminated cherry blossoms will leave an indelible impression on you. There are about 40 cherry blossoms, helping to transport you to a dream world of vision and fragrance; set amongst a backdrop of the Shirakawa river, the soothing warm light from Japanese restaurants, the Tatsumi Daimyojin shrine, the Tatsumi-bashi bridge over the river, walk on cobbled paths, wooden Machiya houses and the many trees line the route. It is so Japan – simple, historical, calming, warming – and always the possibility of spotting a Geisha. So Gion Shirakawa is a very special place that you can’t miss! Gion Shirakawa has often been used for films and TV dramas because it fully represents the image of Kyoto. At the end of the day, having enjoyed strolling around, dusk descends. Now Gion shows a different face. A fantastic place to explore, amid glowing lanterns illuminating your path, quietly, serenely. As darkness takes a hold, “Kyoto Nightlife in Gion” is the only thing that exists. It is not only Hanami-koji Street or Gion Shirakawa that you must visit, but I strongly recommend Pontocho (先斗町). Pontocho alley, running alongside the Kamogawa river, is full of high-class Japanese restaurants and trendy bars – so that it is really up to you where you choose and what you experience whilst there Kyoto. These places openly welcome foreigners with a smile and an English menu. Geisha and Geisha have been resident in Pontocho since the 16th century, so naturally, there are many traditional ochaya (where Geisha and Geisha entertain) still there. So It is highly likely that you would spot Geisha and Geisha during a visit to Pontocho! I recommend that you explore the area after 6 pm, as the time for Geisha and Geisha to head off to the various ochaya to entertain and perform. Even Japanese get excited to see them! To further enhance your night-time activity in Kyoto, wouldn’t it be even more amazing if you could actually experience spending some time with a Geisha! It is a very rare opportunity that even the Kyoto residents are unable to do. The traditional artful world of the Geisha, – and Ochaya – is such a mysterious and hidden one, very different from the commercial realms of modern Japan. It is a world that encourages a tradition called Ichigensan okotowari. To be accepted as a customer, you must have an invitation from another regular customer – It is a matter of trust. But don’t get me wrong, this doesn’t mean this world rejects new customers (including locals and foreigners), but the ochaya believe that by doing this, they can actually treat their customer better through having a proper relationship. They want to be sure to look after all their customers, making them happy and satisfied, so the only way a new customer is accepted is by having a recommendation from an existing customer. So you can imagine how difficult for even the local people to be a customer, and even more difficult for visitors who really don’t know any other regular customers. But here is a secret, your dream of having the opportunity of the company of a Geisha could come true, it is offered by Enchanted Time with “Maiko” – it is a fabulous deal. Everything is arranged for you; a beautiful Japanese meal, the company of a Geisha with whom you’ll converse, and if necessary, an interpreter. You’ll play Ozashiki games and experience with her full attention. A great experience for someone wanting more than just observing a Geisha or Geisha at distance from the street. Due to the difficulty acquiring time with a Geisha, you’d think the Geisha are fake – very common in Kyoto. But the Geisha of Enchanted Time with “Maiko” are 100% genuine; traditionally trained in Kyoto Geisha have done for hundreds of years. Make the most of this opportunity from Enchanted Time with “Maiko” – chatting, playing and taking pictures with a real Geisha really is possible on a reasonable budget! Yasaka shrine has a long history, covering over 1,100 years since it’s inception. Do you know that Gion and Yasaka shrine are intrinsically linked? Have you ever heard of the Gion festival? The dynamic and resplendent Gion Festival is an annual festival of the Yasaka shrine. This exceptional festival is held for one month every year – from July 1st to the 31st. The festival – which used to be called ‘Gion Goryoe’ – started as a prayer to stop an epidemic spreading all over the Japan in 869AD, by building 66 hoko (a type of spear) in Shinsen-en, which is a large garden in Heian-Kyo City, and they were carried around in a portable shrine. The number 66 represents the number of Japanese provinces at that period. The festival is still held every year, and on a massive scale, with hundreds of people involved, attracting more than a million visitors each year, and it’s definitely one of the biggest festivals in Japan. Everyone is somehow involved in the festival, with all people naturally living with the festival for the whole month. There’s much to tell regarding the Gion Festival, so if you plan to visit Kyoto in Summer, I recommend that you try to join in – it’s something you won’t ever forget! Let’s review all the things I have explained about Gion and the Geisha Districts in Kyoto. Gion is a Geisha district in Kyoto due to a number of ochaya located there. Do you remember the nearest station to Gion? Yes, it is Gion Shijo Station, which you can see on the map above. You can visit many temples and shrines including Kennin-Ji Temple in the south, and you can see many ochaya where Geisha and Geisha apply their trade. Must see places are: Hanami-koji Street and Gion Shirakawa where you might be able to meet a Geisha and experience the real Kyoto. Additionally, you might bump into a Japanese samurai being filmed in those areas. You can not miss the Kyoto Nightlife in Gion, where there are great restaurants, from high-class to Izakaya pubs, bars, and clubs, all crammed in one area. Pontocho is also a very interesting place for you to visit. Do you remember why? Because you have a good chance to see a Geisha or Geisha there! 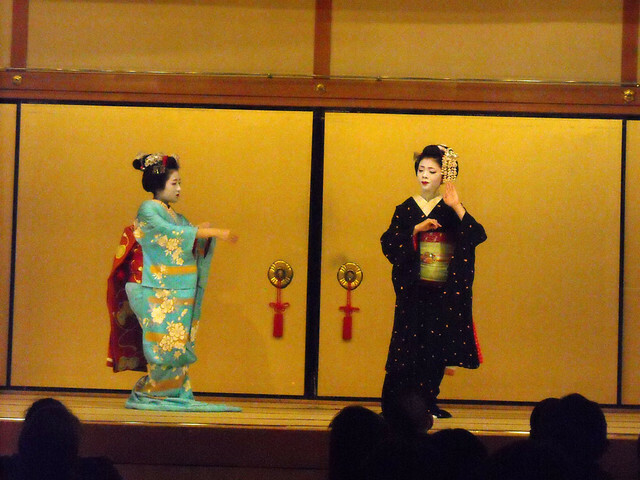 Geisha and Geisha have been present in Pontocho since the 16th century. Don’t forget to try to be there after 6 pm as this is the prime time for Geisha and Geisha viewing, as it is the time of the day when they head for the ochaya for their performances. You could also join the Gion Festival during the Summer month of July, which would be an experience of a lifetime. The last thing, if you would love to enjoy the company of a Geisha, in a typical Japanese environment for chatting, playing games and taking pictures – or even video – is a tour offered by Enchanted Time with “Geisha”, and it is a great deal. I really hope that you have enjoyed reading this article, and perhaps one day, you will get to meet a real Geisha or Geisha!